TimesUnion: Harry Orlyk talks about his paintings and the land. 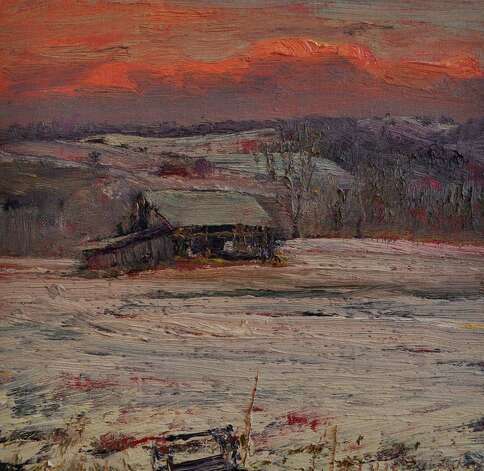 For more than a quarter century, painter Harry Orlyk has transformed rural Washington County into light-infused essays. Almost every day, Orlyk ventures out into the seasons to capture dapples of gold, honey browns, snow whites and verdant tones that envelop the countryside. Fading light yields the moon in “Moon Rise (No. 4830).” It casts a subtle luminosity over rolling hills, a stand of trees and sloping farmland. The scene is nearly sculpted by his ardent and soft brush strokes directing oil on linen like clay, leaving an impression like a dream, or memory. It’s hard to escape the sense that you’ve been there before, but when remains elusive. “Moonrise” is one of 40 paintings included in the “Plain Air” exhibit at the Laffer Gallery in Schuylerville, a survey of recent works by the prolific artist raised in Cohoes. Each has a number, like a date, archiving a view from around his home in Salem. Yet they aren’t merely documenting in a nostalgic way but engaged with the here and now. Although his paintings are nearly devoid of humans, they’re very much about us, the environment, civilization and the future. Sitting outside his rustic home and studio hard against White Creek, Orlyk, 66, who was a recipient of a prestigious Guggenheim Fellowship, took time to answer a few questions about nature, philosophy and art. Q: You’ve primarily been painting Washington County for so many years. What is it that makes it so appealing to you? A: Washington County, like other parts of the world, is part of an ongoing cycle of light and season; by merely being sensitive to this in a painterly way there is always something familiar presenting itself in a new light. Q: How did find your way to Salem? A: A long series of dreams led me home to the Hudson Valley and to Salem. Painting has been only part of understanding something about human life in my village and surrounding hills. Much of what I have learned was that early people, including the land’s original inhabitants lived well and long here. Their story is my mission. Q: Early on, you were a figurative painter, but living in Nebraska for your MFA you discovered a deep connection to the landscape. How did this all come about? A: The friendship with a handful of painters and photographers at the University of Nebraska and a 1974 trip to a South Dakota Indian reservation (for a sun dance) led me to the land as a pertinent subject to paint, being the most essential element to life. Q: The exhibit at the Laffer Gallery is called “Plain Air,” a reference to painting directly from nature by taking easel and palette outdoors, but you work from the driver’s seat of your car. Why? A: I originally looked like a landscape painter working with an easel and palette outdoors, standing before a view of the open land. One day, in the rain, trying to paint a view outside of Lincoln, next to a construction site, my painting got gouged out and pecked by the drops. I decided to finish (the) work sitting in my Volkswagen bus. From that day I have worked almost exclusively sitting in the driver’s seat of a van, painting clamped to the steering wheel and palette on the passenger’s seat. Q: Aside from bucolic vistas and connecting to the land, your paintings are really about light, aren’t they? A: I paint light’s effect on the land but I paint days as well. Every day has its own face. Q: What is your personal relationship with nature and are your paintings merely nostalgic or are they messages about changing our understanding of how we interact with the environment? A: I feel that I live and paint with a cause to connect people, like these ancient neighbors of mine. My paintings are honest interpretations of the way it was through the years. Here is where I believe our circles intersect. The ancient Algonquin and I both love the same flow of water, the same horizon, weather, moon, sunlight, migrations and nightfall gatherings of deer. I believe this relationship has made me more thoughtful about how I impact the environment. It’s hard to hurt what I love. Tim Kane is a freelance writer in Albany.